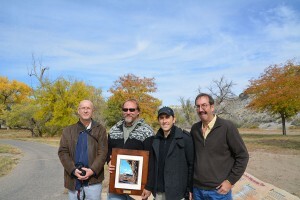 Irek Walaszczyk (Warsaw University, Poland), Brad Sageman (Northwestern University), Steve Meyers and Brad Singer (UW-Madison) at the dedication of the Cenomanian-Turonian GSSP signs in Pueblo State Park, CO. October, 2013. 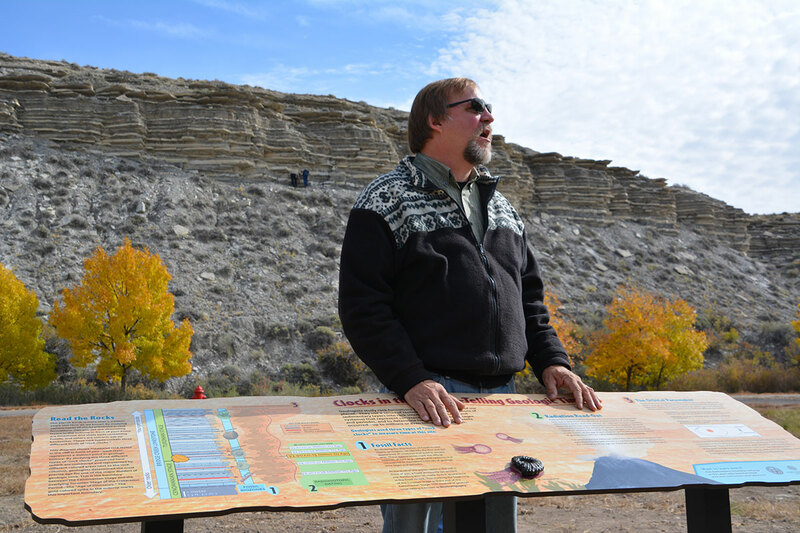 Brad Sageman from Northwestern University with one of the two signs installed at Pueblo State Park, CO. Photo by Brad Singer, October, 2013. As part of a collaborative NSF grant to revise the Cretaceous time scale, PI Brad Singer, Brad Sageman from Northwestern University and Steve Meyers created and installed two signs like the one above at the GSSP for the Cenomanian-Turonian stage boundary that crops out in Lake Pueblo State Park in Colorado. This park is visited by 1.8 million people each year. The signs highlight the GSSP (globa stratotype section and point) and describe the radioisotopic and astronomical dating methods that we applied to these rocks. The signs are targeted at making the geology interesting to school children. Note the raised relief ammonite reproduced on the sign! Note the two people up on the outcrop at the “Cenomanian-Turonina Golden Spike”. To provide training in high precision geochronology and astrochronology, in collaboration with Professor Steve Meyers, WiscAr participates in the annual IsoAstro workshop [PDF]. During this 6-day workshop, students and researchers learn how the 40Ar/39Ar and U-Pb radioisotopic clocks work, how modern astrochronology is done, and most importantly what the uncertainties in these approaches are. Following introduction to the history and theory of these dating methods, participants get to work with real data sets and next generation software to discover on their own the power of these approaches. 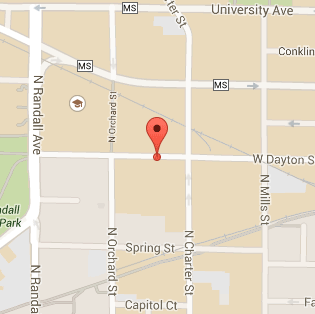 The first IsoAstro workshop was held in Madison in August, 2014. We plan to offer this workshop and offer partial support for participants, annually beginning in 2016. It is anticipated that the workshop venue will alternate between WiscAr and the Boise State Isotope Geology Laboratory for U-Pb geochronology that is directed by Professor Mark Schmitz. The PowerPoint presentations and Word document below include tutorials used during the IsoAstro workshop to introduce fundamentals of radioisotopic clocks, the 40Ar/39Ar method, and basic statistics used when working with radioisotopic dates and data sets.